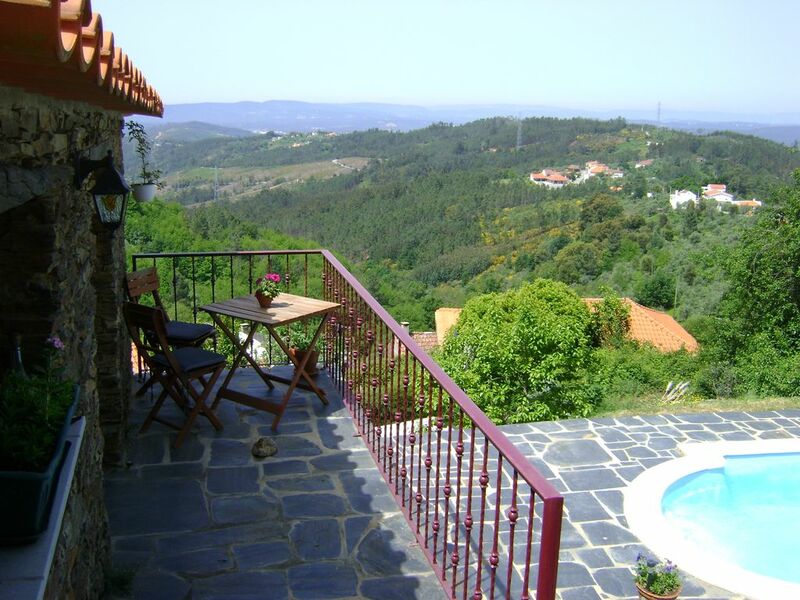 Situated on the outskirts of the mountain village Alqueve. The cottage has only one bedroom but is well equipped and was renovated in 2012. There is a sofa bed in the living area so please contact me if you would like extra guests. It has it's own private pool with loungers, bbq, etc and plenty of outdoor space. Upstairs in the cottage is the living/ kitchen area with a sofa bed for extra guests. The kitchen is fully equipped with fridge/freezer, cooker, etc. The living area has a satellite TV, DVD with DVD's. There is a speaker to play music from a phone and radio. The cottage also has wifi internet access. A spiral staircase leads down to one double bedroom with an en-suite bathroom/wet room. The en-suite is the only bathroom in the house and is accessed through the main bedroom so any extra guests must take this into consideration when booking. If you are looking for quiet relaxation and to get away from your normally busy life then Bela Vista is the house for you. Bathroom is accessed through the main bedroom. Please take this into consideration if booking for more than two people. Half an hour in the car. Golf is in Viseu about 45 min in the car. We spent 10 days in Bela Vista. The area is beautiful and perfect for those who enjoy being outdoors in the country. We intended to do lots of walking over the many trails in the immediate area but found it too hot (the temperature was around 30 degrees for the 10 days we were here in late September), so we explored neighbouring villages in the morning and relaxed by (and in) the pool in the afternoons - bliss! The view from the property is wonderful and we never tired of it. Coimbra is well worth a visit (one hour’s drive away). Beautiful location. Great for peace, quiet and walks. My wife and I had a really relaxing time. Hazel was very helpful and accommodating, with excellent recommendations for things to see and do. The only slight downside is there's nowhere within walking distance to eat or drink in the evening, but Arganil has some nice eateries (about 15 minute drive away). A peaceful cosy cottage with stunning views! Cosy cottage but equipped with all you need. Owners were lovely & couldn’t be more accommodating. We had a wonderfully peaceful stay which is just what we needed. That is what we call a cozy summerhouse! Everything you need is present. We enjoy the swimming pool, the bbq with an amazing view we never forget! Hazel thank you for this special holiday ! The privacy that we obtained, we have hugely appreciated! Sem dúvida o melhor sítio em que estive em Portugal, quer em termos de localização, quer em termos de serviço. Parabéns Hazel e Adam, pelo local, pelo bom gosto e pelos detalhes do vosso serviço. I offer cheaper rates for longer lets over the winter. Please contact me for details.